Worldwide there are more than 600 different species of oak. They thrive across the Northern Hemisphere in China, Japan, Europe, the British Isles, and in all of the continental United States except for Alaska. More than half of the 600 species are native to North America. Yet only about 60 varieties grow north of Mexico. In the forests of northern areas that have short summer growing seasons and long winters, such as Canada, northern Europe, and Siberia, varieties of oak are very scarce. The oak family is a diverse group of trees and shrubs, influenced by climatic and environmental changes. Recent studies indicate that global warming contributes to oak dieback by speeding up the reproduction of beetles and fungi that attack oak trees. 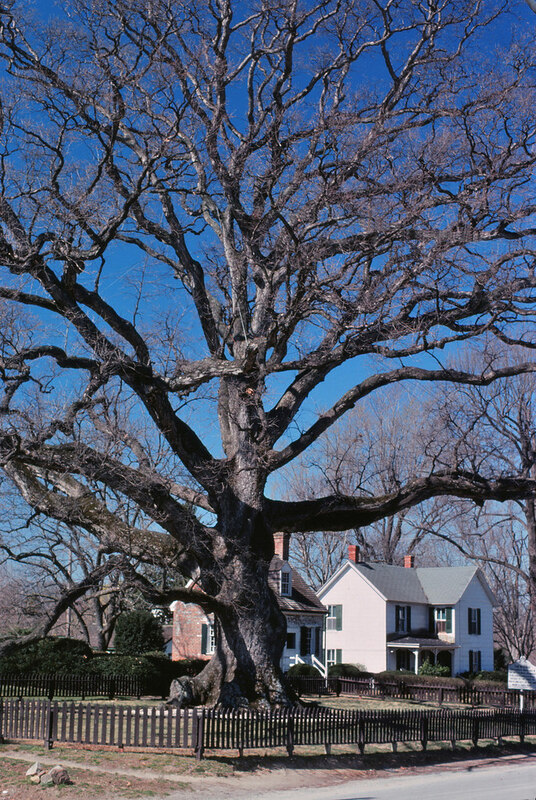 There are oaks that grow to heights of about 100 ft (30.5 m), while other types never grow larger than a small shrub. In warmer climates, oaks are evergreens, keep their leaves all year long, and are often used as ornamental trees in parks. In colder climates, they usually drop their leaves in autumn. Many of these deciduous oaks have leaves that turn brilliant gold or scarlet in the autumn. In spring small, yellow green flowers appear. The male flowers hang in clusters called catkins and have profuse amounts of pollen. This oak pollen is carried by the wind to fertilize female flowers that produce acorns. Oak trees grow very slowly. In 80 years, it’s estimated that one will grow to no more than 2 ft (0.6 m) in diameter. Oaks do not even produce acorns for their first 20 years, but they live a very long time. Average life expectancy for most oaks is between 200 and 400 years, and there are oak trees over 800 years old that are still alive. 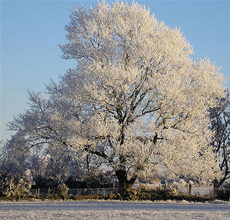 Oaks are divided into two basic categories: white and red. The leaves of most of these are characteristically lobed, and depending upon the variety, can have anywhere from five to 11 lobes. Historically, the oak has been considered sacred by many civilizations. Abraham’s Oak, the Oak of Mamre, is thought to be on the spot where the bible states Abraham pitched his tent. Legend states that anyone defacing this tree will lose their firstborn son. Both the ancient Greeks and Romans revered the oak, but its longest association has been with the British Isles. The Druids considered it to have both medicinal and mystical significance. For centuries, an oak sprig was inscribed on English coins. Legend states that King Arthur’s round table was made from one gigantic slice of a very ancient oak tree. Oak has been used as a medicine since the ancient Greek and Roman times. The famous Roman doctor Galen first used oak leaves to heal wounds. The American white oak, Quercus alba, and the English oak, Quercus robur, have bark with similar healing qualities. Oak bark contains saponins, tannins, calcium oxalate, starch, glycosides, oak-red, resin, pectin, levulin, and quercitol. Oak wood as timber is prized for its strength, elasticity, and durability. It is ideal for making furniture, barrels, railroad ties, and in the past, ships. Oak acorns are a source of food for wildlife and have been used as fodder for farm animals in the past. A flour made from ground acorns was also a part of the diet of Native Americans. The tannin in oak bark is used in leather preparation. Cork is made from the bark of some species that grow only in Spain and Portugal. Recent advances in molecular genetics have shown that DNA from samples of oak can be isolated and analyzed. This type of analysis has a variety of potential applications in archaeology and forensic investigations. Oak used to make wine barrels has been found to increase the antioxidant activity of wines aged in the barrels as well as adding a distinctive aroma to the wine. The increase in antioxidant activity can be measured by a new technique known as electron paramagnetic resonance, or EPR. Oak bark is used in medicine as a bowel astringent to treat diarrhea and as an anti-inflammatory gargle for soothing sore throats. It can be used topically for such skin inflammations as dermatitis, as an enema for hemorrhoids, or as a douche for vaginal infections and leukorrhea. A study in 1980 showed some evidence that oak bark may prevent kidney stone formation and act as a diuretic. A 1990 Russian study demonstrated that oak bark had antibacterial activity against Staphylococcus. One study in 1994 showed that oak bark could reduce serum cholesterol levels in animals. One teaspoonful of pulverized oak bark powder can be added to 1 cup of water, boiled, and then simmered at a reduced heat for 15 minutes to make an oak bark tea. This tea can be taken internally as an intestinal astringent up to three times per day. Oak bark is also available in both an extract and a tincture. For rinses, compresses, and gargles, 20 g of pulverized bark should be dissolved in 1 qt (1 L) of water, and prepared in the same manner as the tea. Oak bark is also available as snuff, tablets, and capsules. Oak bark should not be used externally over large areas of skin damage or used as a full bath. Oak bark for gargles, enemas, or douches should not be used for more than two weeks before consulting a doctor. A doctor should also be consulted for any episode of diarrhea that lasts longer than three days despite treatment with oak bark. No side effects have been reported when oak preparations are used at recommended dosage levels. Patients occasionally experience mild stomach upset or constipation if the dosage is exceeded. Oak bark preparations are believed to inhibit or reduce the absorption of such alkaline drugs as antacids. In addition, oak bark has been found to reduce the effectiveness of codeine and atropine.